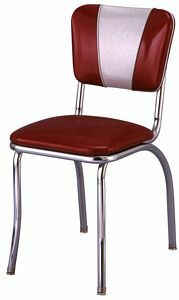 No other retro diner chair has ever been as popular as the v-back diner chair. The V back diner chair features a decorative upholstery style that uses two different sections of uphosltery vinyl to create a v pattern on the back of the chair. This v is typically done in two contrasting colors, but can also be done with the same color. V back diner chairs look great with Cracked Ice Vinyl and with Naugahyde Zodiac vinyl. This type of diner chair makes a great restaurant chair and also makes a great kitchen chair. If you are looking for diner chairs for your home, commercial restaurant diner chairs made by Richardson Seating are an excellent choice. Commercial diner chairs will last much longer than inexpensive residential furniture. Restaurant furniture is built to last for years in a restaurant under heavy use. If you are buy the diner chairs manufactured by Richardson Seating, the chairs will last a very long time. No user responded in " V Back Diner Chairs | Vback Diner Chair | V Back Kitchen Chairs "